Before you get that credit card out, these 6 tips for buying the right pet stroller will help you choose the best one. Although I will be mentioning dogs specifically (because I use it for my dogs), a stroller can be used for cats as well, and of course the same tips apply. 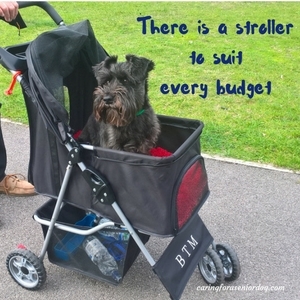 Are you buying the stroller for a dog that is full grown or still growing? Full grown, no problem, you already know his weight. If your dog is still growing, at which stage of his life do you anticipate the need for one? If it’s for immediate, short term use, again no problem. If you anticipate a need a few months down the road or you’d like it for long term use, buy one based on your dog’s full grown size. Don’t know? Make a rough guess and err on the big side. One that is too small will be of no use, but one that is bigger can always be adjusted with a blanket or bed. There are so many uses for a pet stroller, knowing what you need it for will help you choose the best match. Quiet walks around the neighbourhood? Taking your pets shopping? Car trips? Festivals and events? More than one pet? Jogging? For example… if you’ll be taking your dog on car trips, you not only want a stroller that folds, you may also find it handy to have one that converts into a car seat. More than one pet at a time? How about an extra wide or double stroller? Love to cycle with the family on the weekend? 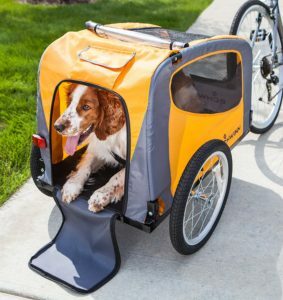 A stroller that converts into a bike trailer means the four legged family members aren’t left behind. stroller could serve all your needs? A basic model with small wheels suitable for light strolls won’t stand up to jogging on uneven surfaces, but a jogger may be perfect for casual walks. As you can see in the above picture, our stroller is best on paved surfaces so…hubby to the rescue!! These two tend to go hand in out, so I’m addressing them together to avoid being redundant. For the occasional walk or trip to the vet, you may very well be fine with an inexpensive stroller, especially if you have a small dog or cat and weight isn’t an issue. If you will be relying on it quite a bit in a variety of situations, you are going to want to look seriously at the quality. It may cost more initially, but you will save money in the long term by not having to buy a second one when the first one breaks, or outlives its’ usefulness. Even if your dog never wears a harness, I recommend you put one on him when in the stroller. I also suggest attaching a leash to it and holding on to it, as you would when walking. Most strollers also come with a tether that attaches to the ring on a harness or collar, so use that as well for added safety. 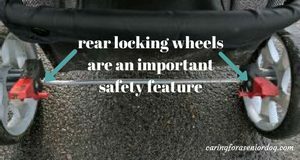 Another important safety feature are rear locking wheels. If you stop to chat to someone and let go of the stroller, or you’ve left it while you take him for a walk, a slight slope and it’s rolling down the hill. Engage the brakes with your foot, and prevent that scenario from happening. Buses aren’t the smoothest ride, so if you have to take it on public transportation, the brake will keep it from rolling around. I recommend you still keep a hand on it just in case! What if you’re using a trailer attached to a bike? You may have a rear view mirror on your handlebars, but you can’t keep constant watch. Double and triple check the connection to your bike, and make sure they are securely fastened before you set off. Let me add one other note to this…if your dog has never been in a stroller before, I don’t recommend this as his first experience. First get him used to it on quiet streets, then busier, and see that he’s comfortable before you have him whizzing around traffic filled roads. If you’re at a festival or crowded area, and your pets seem nervous, a very important safety feature is the ability to create a den. The stroller you choose should have a zipper or other type of closing to secure the folding canopy to the body of the stroller. Also check for gaps in the fabric or other possible escape points, in the event your dog panics. You don’t have to rely on someone else’s opinion to make your decision, but it can be helpful to read what owners of products have to say. I like to read several to see which themes are common. As with any product, there may be slight discrepancies between the manufacturer’s claims and real user experience. As far as I’m concerned, this is one of the greatest products you can buy, and it has been of more help to me than you can imagine. These 6 tips for buying the right pet stroller will have you wheeling your pets around in no time. Thank you Rachel. 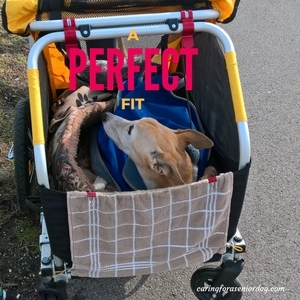 This pet stroller has helped all of us in so many ways. If you’re buying for a cat – check for small spaces they could escape through, and the sturdiness of the mesh and fabric. These are really important considerations for a pet stroller, thanks. A stroller that converts to a bike trailer would be so great for us! I’ve met several people who use a bike trailer for their dogs, and they all love it. My husband and I cycle but I wouldn’t be comfortable using it for my dogs, especially where we live. 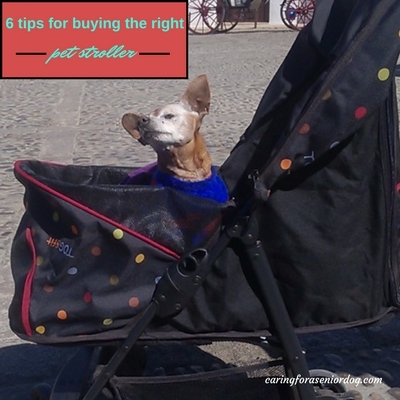 Great tips for those pet parents who need or want a stroller! Thanks for sharing. Thanks Nichole. Our pet stroller has been a real life saver (definitely a back saver! ), and I want to spread the word about how useful a stroller is, in so many situations. 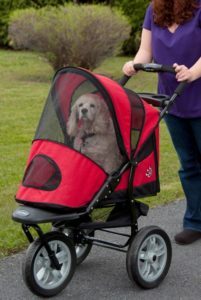 Honestly I had never even thought of getting a pet stroller before but I think my Lyla would love this plus it would be a good and safer way to get her more socialized! Thank you for this article! Great help for me! I’m so glad Joely. The number of scenarios I’ve discovered a use for a stroller is growing. Not only for senior dogs or those recovering from surgery, but perfect for getting a dog socialised. Having a safe place for her to retreat to when it gets too much is a big help, and a comfort. The stroller I was using at Blogpaws had some gaps in it so Mr. N would try to slither out. He wasn’t panicking or anything. He wanted freedom lol. Mr N obviously didn’t want to miss anything, cute little guy! That is something to watch out for, gaps that dogs and cats can slip through. For that reason I use the built in tether for my younger dog Jack, as well as keep a leash on him that I hold onto. He’s using the stroller because he’s recovering from spinal surgery, but it’s still a good idea, safety wise. This is an informative post. I have young-ish large dogs. Not relevant for us at this stage, but good to think about for my friends with smaller and/or older dogs. Thanks Susan. My stroller has been such a huge help, I want people to know the many ways it can help them too. Actually there are strollers advertised that can hold dogs up to 150lbs. That may be slightly optimistic, but they definitely aren’t only for small, old dogs. My 4 year old is recovering from spinal surgery, so I take the stroller with me on our outings, and once his time limit for walking is up, he goes back in the stroller. Better than having to carry him!! We used our daughter’s stroller with our older yorkie in his final years. It worked for him, but wouldn’t work for many animals. He sat nicely and we were able to strap him safely. He loved going for “walks” in it. Great idea. Even if a dog just gets to enjoy the sites, it gets him out of the house, and stops him from getting depressed. We looked into getting a pet stroller for my sister’s Pug, but she passed away before we could make a decision. I wish I had read this earlier, so many important things to consider. So sorry to hear that. Pet strollers are so helpful, and there are things to consider that will help the decision making process. Great post for people that are thinking about getting a stroller. Luckily there is not as many options as strollers for children! Thanks Maureen. There are definitely a lot of choices in pet strollers, but not as many options as for kids and luckily is right! I had a hard enough time choosing as it is. Strollers have not taken off in NZ but they are slow to pick up on these things. I can see how important it would be to get the right one and getting the sizeright. I lvoe your tip of ‘terrain’ buying a lightweight model then flining it around over rough ground will not work! I’ve only seen a couple where I live as well, but hopefully the more people see us and talk to us, the more they’ll see the benefits for their pets. The surface you’ll be rolling on is a definite consideration, in the decision making process. I used to cringe whenever I saw someone carting around a dog in a stroller. I never considered that the dog was older and still got to enjoy the outdoors because of them. Thanks for this information! I admit I did as well. I assumed they were being used as accessories and people were just showing off. I’m sure that was the case at times, but now that I use one, I realise I shouldn’t have judged. Without a stroller, many dogs would be stuck inside, and how sad that would be! I have not tried Kilo the Pug in a stroller yet but I have seen they can be very useful for events. Thanks for the tips. They are perfect for events for so many reasons. Smaller dogs can easily get stepped on, and dogs of any size can grow uncomfortable in large crowds. Fear may make them lash out or even freak out and bolt. Not to mention all the dropped food and spilled drinks they’ll be licking off the pavement. I’ve thought about a stroller if I ever decided to travel with the girls. Thanks for the tips. A stroller is perfect for travelling. Easy to fold, and gives the dogs a safe den in unfamiliar surroundings. There’s also a better chance you’ll be allowed into various attractions and locations you might otherwise be denied access to. I have been thinking about getting a stroller for my 2 cats. These tips are a great place for me to start while I’m looking. Due to cold Michigan weather, I probably won’t purchase one until spring. I will have to keep an eye out for pet strollers with the place to hook the harness. I wouldn’t want my cats running off if something startled them. Hi Robin, they are great for cats, depending on their temperaments of course! 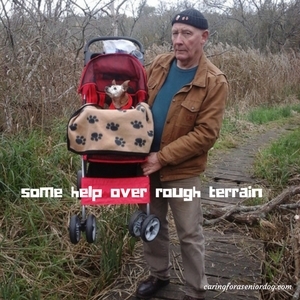 None of my cats could have used the stroller – they would have bolted in seconds. They do come with safety leashes attached, and when deciding look for gaps they could jump out of, and check the quality of the mesh and fabric. My cats would have been so petrified they would have shredded the thing in seconds. That’s a shame Malaika, but a baby stroller is perfect as well. So great to hear her dog is able to get out and enjoy some fresh air and the sights. Great informational post on pet strollers! While I do not use these with my Siberian Huskies, I’m going to pin this on my Bark About board for others to read! Thanks for sharing this important info!